A Fictionalized Life of Jesus? About this Website: This website contains information about the life and works of Maria Valtorta, a famous Italian Catholic mystic who lived from 1897 to 1961. From 1943 to 1951, Valtorta produced about 15,000 handwritten pages in 122 notebooks. Her total writings include a series of almost 700 visions of Jesus’ earthly life with Mary, the Apostles, and many of His contemporaries, about 800 dictations from Jesus, and around 300 other revelations from God the Father, the Holy Spirit, Our Lady, and various angels and saints. The best-known outcome of these works of Maria Valtorta is the epic The Poem of the Man-God (now entitled The Gospel as Revealed to Me in the second English edition), which begins before the birth of Mary and ends after Mary’s Assumption into Heaven. This is the longest, most vivid, and most true-to-life revelation of Our Lord’s and Our Lady’s life ever given to the Church with its almost 4,200 printed pages of visions and descriptions of the Gospel. Approximately 98.5% of all the Gospel passages in the canonical Scriptures that relate the lives of Jesus and Mary have been described in unprecedented detail in her work, in addition to an abundance of previously unrecorded events. Maria’s writings have profoundly affected the lives of hundreds of thousands of people around the world and her work has been translated into over 30 languages. There are a tremendous number of testimonies about her writings from bishops, noteworthy clerics and lay faithful, and even saints. Those who have approved/endorsed/praised the Poem of the Man-God/The Gospel as Revealed to Me include Pope Pius XII, 4 cardinals, 14 archbishops, 10 regular bishops, 24 extremely learned clerics or Doctors of Theology/Divinity/Canon Law, 7 Members or Consultants of the Holy Office/Congregation for the Causes of Saints, 7 Saints/Blesseds/Venerables/Servants of God, over 28 university professors, 2 famous television show hosts/media personalities, and countless priests and lay faithful. For details on the canonical status of Maria Valtorta's work and what the position of the Church is on her revelations, see: What is the Position of the Church on Maria Valtorta’s Main Work? "I have been studying, teaching, preaching, and writing Mariology for half a century already. To do this, I had to read innumerable works and articles of all kinds on Mary: a real Marian library. However, I must candidly admit that the Mariology found in all of Maria Valtorta's writings – both published or unpublished – has been for me a real discovery. No other Marian writings, not even the sum total of everything I have read and studied, were able to give me as clear, as lively, as complete, as luminous, or as fascinating an image, both simple and sublime, of Mary, God's Masterpiece. It seems to me that the conventional image of the Blessed Virgin, portrayed by myself and my fellow Mariologists, is merely a paper mache Madonna compared to the living and vibrant Virgin Mary envisioned by Maria Valtorta, a Virgin Mary perfect in every way. ...whoever wants to know the Blessed Virgin (a Virgin in perfect harmony with the Holy Scriptures, the Tradition of the Church, and the Church Magisterium) should draw from Valtorta's Mariology." If you are new to the writings of Maria Valtorta, we gladly welcome you and encourage you to try her writings for yourself. If you are already a reader of Maria’s writings, we hope that you find this website and its contents an aid to you in further understanding and enjoying these truly unique and extraordinary writings. 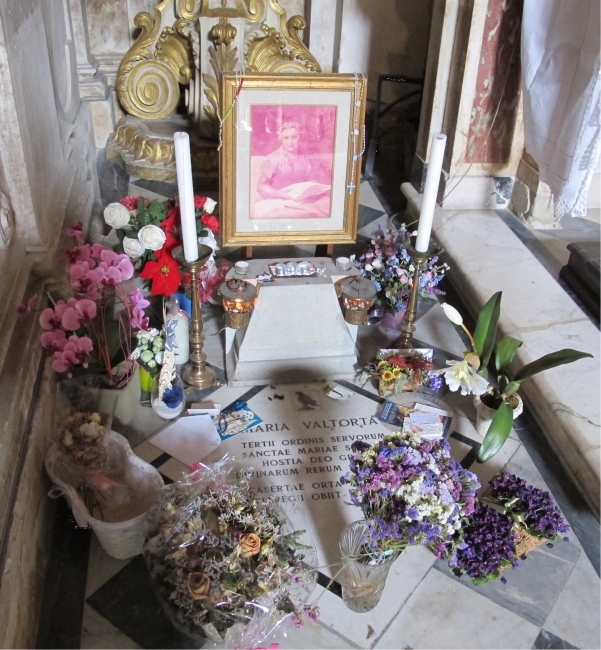 The Offerings of the Maria Valtorta Readers' Group: The Maria Valtorta Readers’ Group offers 35 booklets that contain excerpts from Valtorta’s writings organized according to themes that are very inexpensive. The Maria Valtorta Readers’ Group also sells indexes/guides to all of Maria Valtorta’s writings (including for both the first and second English editions of her main work) as well as ten audio items, including a collection of MP3 CD’s containing 218 audio recordings of all the Sunday Gospels totaling 55 hours of audio. We hope that these items will be of assistance to you in using Valtorta’s writings in new ways and in introducing and sharing her writings with others. The latest booklets of the Maria Valtorta Readers’ Group are Mercy and Justice (released in May 2016) and The End of Times Prophesies from “The Word of God” – through the Writings of Maria Valtorta (released in March 2013). Mercy and Justice contain passages from the writings of Maria Valtorta that touch on the theme of Justice and Mercy. The End of Times Prophesies from “The Word of God” – through the Writings of Maria Valtorta replaces the now out-of-print The End Times – as Revealed to Maria Valtorta. It retains most of the previous passages from Maria’s Notebooks that were present in the previous publication, but now has almost twice the number of passages, drawing from The Poem of the Man-God, The Book of Azariah, and The Lessons on the Epistle of St. Paul to the Romans. David Murray has also released a new free e-book: "Maria Valtorta’s Writings and Scripture". For more information and to download it, click here. The New English Edition of Valtorta's Work: Maria Valtorta’s work was translated from the original Italian into English, and the first English edition was published in 1986 as a hardcover 5-volume set entitled The Poem of the Man-God. In 2012, this was officially replaced with the new second English edition, a softcover 10-volume set entitled The Gospel as Revealed to Me. Please note that even though the title The Poem of the Man-God is officially being replaced with the title The Gospel as Revealed to Me, most documentation, books, and websites discussing this work have used the title The Poem of the Man-God for decades. Therefore, learn to use these two titles interchangeably as we move forward into the future. Everything written about The Poem of the Man-God also pertains 100% to The Gospel as Revealed to Me, and vice versa. A member of the Readers’ Group (Stephen Austin) has written a popular and widely distributed e-book entitled A Summa and Encyclopedia to Maria Valtorta’s Extraordinary Work (PDF, 11 MB, Last Updated: June 13, 2017). This e-book covers almost anything a reader could want to know about Maria Valtorta's The Poem of the Man-God / The Gospel as Revealed to Me, including its importance, its history, its ecclesiastical status, how it compares to other revelations, the proofs of its divine origin, its critics and defences, and the supplementary resources available for use with it. [...] In the same vein as Lavère, ranks the work of another engineer, Stephen Austin, from the United States, a young thirty-year old man. He originally ran up against this mystic’s work for the sole purpose of repudiating it, but he then ended up subdued by the completeness and beauty of her The Poem of the Man-God (now known as The Gospel as Revealed to Me) to such extent that he dedicated four years of research to compile his e-book in English A Summa & Encyclopedia to Maria Valtorta’s Extraordinary Work and present it to the public, at this first International meeting. Constantly updated, Stephen’s work has 13 chapters and 49 subchapters, in which he introduces The Gospel as Revealed to Me to readers. The theological objections of the Church against private revelations are eviscerated in this e-book by a careful investigation of the approval that Valtorta’s work has received from saints and prelates: Saint Padre Pio and Saint Teresa of Calcutta; Pope Pius XII; cardinals, archbishops and bishops; 23 doctors of theology, divinity, or canon law; 16 university professors; etc. Stephen Austin then compares Valtorta’s visions with those of the other mystics, Blessed Anne Catherine Emmerich and Venerable Mary of Agreda, both of which are less detailed and less accurate. He also emphasizes the almost absolute correlation between the Gospel and the text of Viareggio’s mystic, with the difference that, compared with the 141 days of Jesus’ ministry in the Sacred Scriptures, there are in The Gospel as Revealed to Me about 500 days, presented in much greater detail, historically valid, on account of the valuable and unique information on botany, geography, ethnology, and astronomy. Austin’s e-book is known as far as Oceania and Australia, thanks to his promotional work, which included participating in an interview on the Australian TV program of a religious nature Spirit of Life. This Australian TV interview mentioned in the article above was aired on Australian television in February 2014. In this interview, Stephen describes his personal experiences with Maria Valtorta's writings and how it has transformed his life and the lives of many other people around the world, what led him to do research on her writings, and his findings. You can view the interview below.